Perhaps the cars were going a bit fast at the December Goodyear tire test after all. 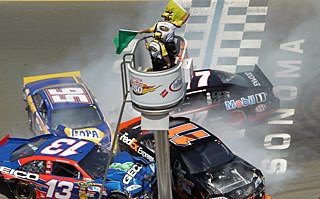 Several NASCAR drivers and teams confirmed Thursday they have been informed the sanctioning body has decided to reduce the size of the holes in the restrictor plate used in next week's Sprint Cup Series test at Daytona International Speedway from 30/32nds of an inch to 29/32nds of an inch. The change will likely reduce speeds - which reached nearly 200 mph at the December test - around 5 mph in the draft. “When we tested during the Goodyear tire test at Daytona, I could see the speeds of two cars that got together being high,” said Bobby Labonte, who drives for JTG Daugherty this season. “When you get to actually racing, things always go a little faster. "I think making the restrictor plate smaller is a deal where NASCAR was foreseeing that speeds would be really high." All Cup teams will participate in next week's test, which begins Jan. 20. Only 18 teams were involved in the December test. The tests are being held because of the repaving of the speedway. "I think now, we can expect to see the cars a lot closer together and more in one pack versus two, three or four. It’s going to make for some great racing for sure," said Pat Tryson, crew chief for Martin Truex Jr.
"I expect to see more three, maybe four-wide racing at Daytona which is exactly what we saw at Talladega Superspeedway."